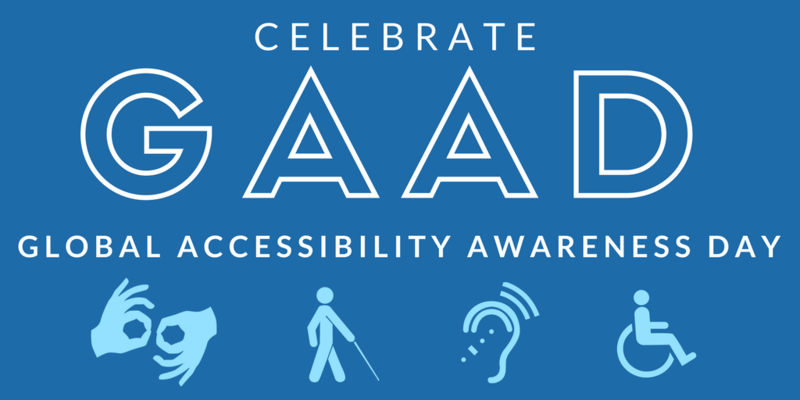 Today is Global Accessibility Awareness Day (GAAD). GAAD aims to get you talking, thinking and learning about digital access/inclusion and people with different abilities and talents. Accessibility is about everyone. It is extremely important for students with disabilities to have access to accessible course content. 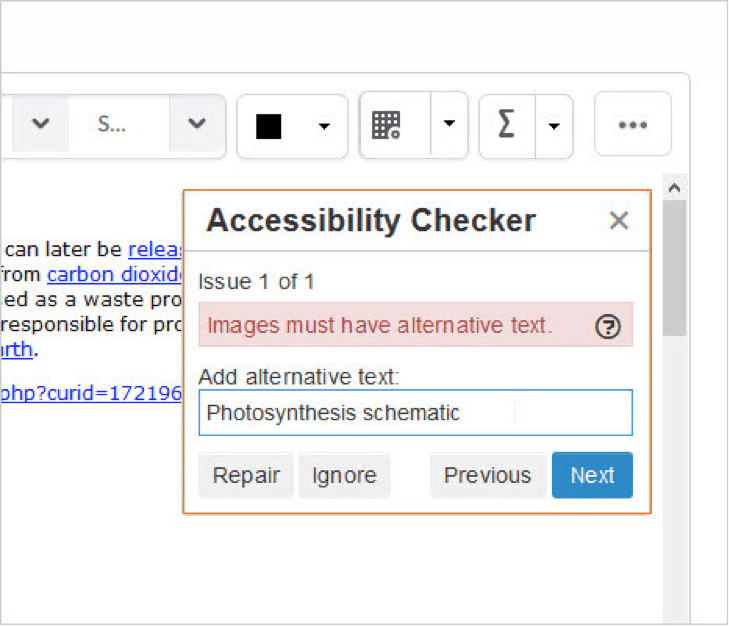 The Brightspace HTML Editor has a built-in accessibility checker that makes it easy to check for issues or offer suggestions to fix identified accessibility issues. After you add content to the HTML Editor, click the accessibility checker icon. Thursday, May 17th is Global Accessibility Awareness Day (GAAD). The purpose of GAAD is to get everyone talking, thinking and learning about digital (web, software, mobile, etc.) access/inclusion and people with different disabilities. While people may be interested in the topic of making technology accessible and usable by persons with disabilities, the reality is that they often do not know how or where to start. Awareness comes first. The key to embracing accessibility – whether online, in the classroom, or on campus is realizing that taking the time to address an issue doesn’t just help a handful of individuals; in the end, everyone benefits. Participants in global accessibility awareness day are encouraged to attempt to go an hour without using a technology most people take for granted – such as not using a computer mouse, attempting to navigate a website using a screen reader, or enlarging all of the fonts in a web browser to 200 percent, to see how functionality may be lost when accessibility isn’t taken into consideration in the design. Whether you participate in an organized activity with others or not, join in and take an hour out of your day to experience digital accessibility first-hand. Author Karen NicholsPublished on May 19, 2016 June 1, 2016 Leave a comment on Today is Global Accessibility Awareness Day! Just a quick note about Global Accessibility Awareness Day. CAT + has posted often on the topic of accessibility and the importance of design features in our courses that benefit ALL learners. But I think this organization has really good intentions--"The purpose of GAAD is to get people talking, thinking and learning about digital (web, software, mobile, etc.) accessibility and users with different disabilities" so I thought I would share the web address with you. In 2011 blogger John Devon posted on accessibility issues, especially in technology, and his blog sparked enough interest to create GAAD. Take a look at their site, join in some of the activities and like them on Facebook if you appreciate their efforts. Thank you, merci, gracias (their site is not only accessible, but is multi-lingual!). Published on May 19, 2016 June 1, 2016 Author Karen NicholsCategories Accessibility Kneads, CAT & Mouse: E-LearningTags AccessibilityLeave a comment on Today is Global Accessibility Awareness Day! 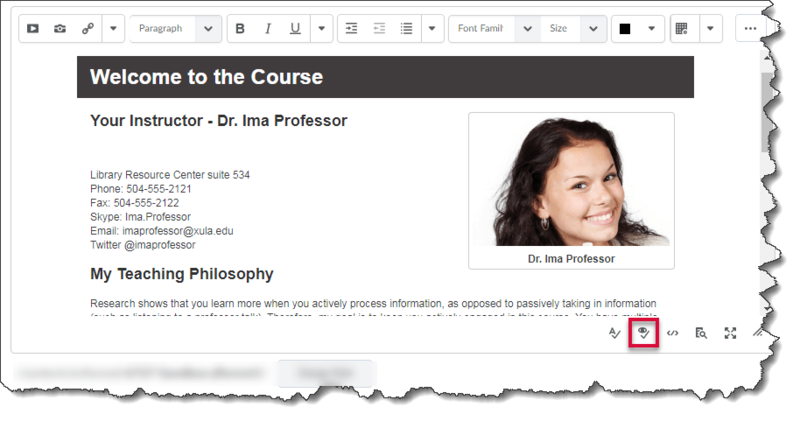 The Quick Links tool allows users to quickly locate any heading or section within any page in Blackboard and jump directly to the link. Quick Links work by pulling all headers and important web page landmarks into an easily accessible screen. This accessibility feature improves Blackboard's navigation experience for all users, but especially sighted keyboard only users. Click on the Quick Links icon located on the top left near the Home tab (or press the SHIFT + ALT + L keys on the keyboard). A pop-up window that displays the landmark and navigation links on the page will open. Any available keyboard shortcuts for the page are also displayed. Press the TAB key to move between the links. Press the Enter key to go to the highlighted link. One of the reasons hybrid and online courses appeal to students is when a course is well designed the student has the opportunity to playback or review a concept until they have mastered it. In order for course materials to be accessible for all learners the course material should be provided in multiple formats. Having the material in multiple modes allows the student to choose the mode that works best for them. If your course material is visual provide an audio version as well. 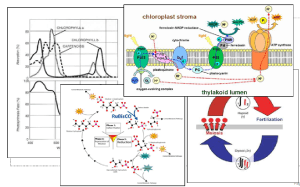 If your course material is auditory, make it visual too. Incorporating transcripts, subtitles, closed captioning to audio and visual content in a course is invaluable for students with disabilities, diverse and/or preferred learning styles, and English as a second language (ESL) students. Designing your courses with accessibility in mind will save you some time in the event you do have a student with a disability. 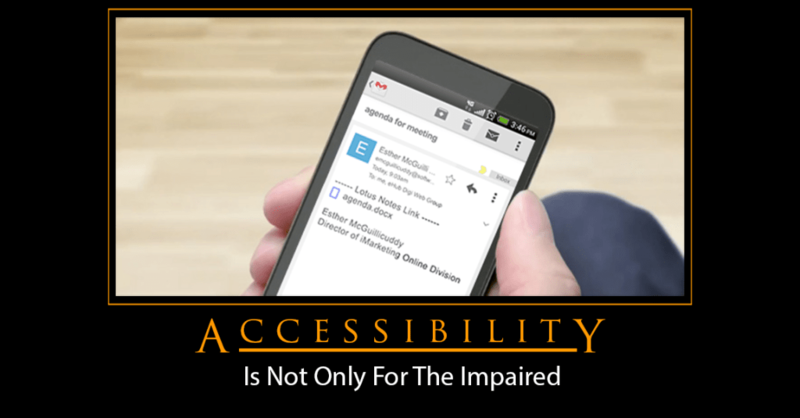 Remember accessible content is not only for the impaired. Students without disabilities will find having accessible resources within your course a bonus. As we start a new year and a new semester it is a good time to start to make your courses accessible. Here is a link to a 10-Step Guide to Making Your Course Accessible for All Students. Computers can read text on a screen but images, graphs, and charts are meaningless to visually impaired users. Alternative text (alt text) is an alternate method for supplying information about images, graphs, and charts to users who are visually impaired. Adding alt text to images, graphs, and charts is an important part of making them accessible. Most images, graphs, and charts can be made accessible using alt text descriptions. However, complex images, graphs, and charts require more detailed description than the limited one or two brief sentences that are used in the alt text. What should you do when you have a complex image, graph, or chart whose meaning cannot be conveyed with alt text alone? There are several ways to handle complex images where a short description is not possible. The best solution is to include a thorough description of the complex image in the content of the page, immediately before or after the image. If you don’t want to add more content to your page, another preferred alternative is to create another web page with the thorough description of the complex image and link to it near the image. You may be wondering what exactly should you include in the thorough description. 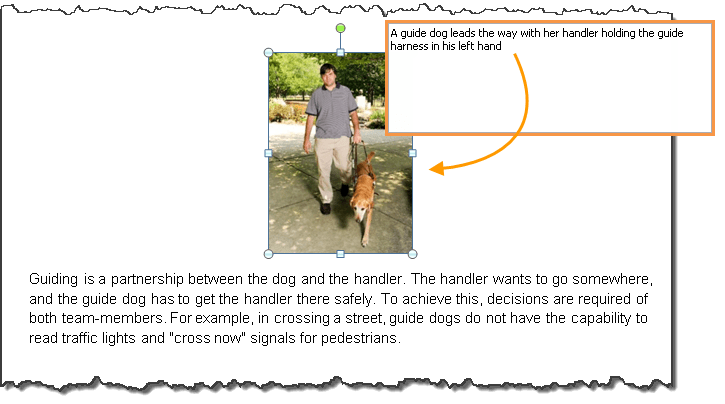 The Diagram Center (Digital Image And Graphic Resources for Accessible Materials) is an excellent resource that provides comprehensive guidelines to make it easier for you to make complex images accessible to all learners. It is extremely important for students with disabilities to have access to accessible course content. Describing complex images utilizing these tips is good course design. Even though you may not have a student with a disability currently enrolled in your course, you will find students without disabilities will take advantage of accessible content as well. Although there are legal mandates requiring institutions of higher education to make educational materials accessible (e.g., the Americans with Disabilities Act and Section 504 of the Rehabilitation Act), accessibility is fundamentally just good design. Content that is accessible is better organized and therefore more usable by all. Accessible content renders properly on a wide variety of devices, it is easier to navigate, and it conveys information in a consistent, logical manner. Moreover, changes in how we view the content are occurring. More and more content is being displayed on mobile devices. For content to appear properly on all devices, it must be well designed. In my recent series of accessibility tips, I identified some things you can do now to design with accessibility in mind as you are creating content and setting up your courses. Designing with accessibility in mind will save you some time in the event you do have a student with a disability. Remember accessible content is not only for the impaired. The sixth tip in my series of accessibility related blog posts will focus on tables. A table is a means of arranging information into rows and columns. Tables are very useful for displaying data in an organized manner. Your course schedule and office hours are examples where formatting this information in a table could make the it more accessible. Tables should be avoided when you want to simply format other content (i.e., just to line things up neatly.) Using tables just for layout purposes is not the best practice for accessibility and may make it nearly impossible for people who use assistive technologies to access the information. If you do choose to use a table to layout text on the page, make sure you lay it out so it will make sense when read from left to right. Text-to-speech software by default will read the information in a table left to right, cell by cell, and row by row. Do not use tabs or spaces to create tables. It may look like a table; however it will not be recognized as a table and can be confusing when read by assistive technologies. Add Row and Column Headers to tables to distinguish the heading text from the data area of the table. Screen readers read simple tables efficiently when the column or row headers are clearly defined. Repeat Row Headers if the table spans more than one page. Tables that are contained on multiple pages should have the header row repeated on each page. When you use tables for the presentation of data, summarize the table to aid reader comprehension. This helps all students to know the high points of a table. Break up complex tables (nested tables and merged or split cells inside of tables) into a series of simple tables. Simple tables are more usable for everyone. The information in each cell should make sense if read without the column heading. For example, instead of entering 1, 2, 3, in a "Chapter" column you should enter Chapter 1, Chapter 2, Chapter 3, in the cells to make it clearer when read by a screen reader. This video shows how a screen reader reads information in tables. There is an example of a good and a bad table layout. The video demonstrates how reading order AND the information in the columns are important considerations when creating accessible tables. In the bad example in the video, the use of the dash and abbreviations for the months can be confusing when read by a screen reader. The abbreviated months would have been less confusing if the year had been included. The use of 1,2,3 in the "Week" column in the bad example can be confusing as well. A better option is to use Week 1, Week 2, Week 3 in the respective column. When applying structure to documents and web content, you should use the appropriate built-in formatting structure tools to do so. Doing so will make content accessible to everyone, including users of assistive technology. On the Insert tab choose Insert Table and select the appropriate number of rows and columns for your table. Select the header row in the table and press the right mouse button. A Table Properties window will open. Select the Row tab and check the box next to Repeat as header row at the top of each page. Press Enter key or Ok button. This header row will be repeated at top of each page. Use the Insert Table function in the Slide layout select the appropriate number of rows and columns for your table. In the Content Editor, click the insert/edit table function ( ) and select the appropriate number of rows and columns for your table to begin adding a table in the text area. You will remove significant barriers for users of assistive technology if you take these suggestions into consideration when creating course content. An added bonus is that if you include properly structured tables when creating your course content you will be ahead of the game in the event you do have a student who requires the use of assistive technology. Remember a properly structured table is good design and can benefit everyone. This blog post will continue my series of accessibility related tips that are intended to provide you with things you can do now to make your course accessible even before you have a student with a disability. My fifth tip in this series focuses on lists. A list is a set of items that share a purpose and/or have common characteristics. Lists are great from an accessibility standpoint because they provide structured order to content in a linear fashion. Properly structured lists help to identify order and hierarchy in documents and web content. Lists that are properly formatted allow all users, especially those using assistive technology, to identify and navigate through a related group of items. List items that are not properly formed or grouped may not be translated properly by assistive technology. Unordered (bulleted) lists should be used when there is no order of sequence or importance. Ordered (numbered) lists suggest a progression or sequence. Compound lists contain multiple levels of classification. For example, a compound home improvement list would have items organized by category (e.g. electrical, hardware, flooring, plumbing.) With compound lists, relationships are shown visually using indents and different item markers (i.e., bullets, numbers, letters, etc.). Compound lists may be difficult for visual users to decipher if the visual cues are insufficient. Also, compound lists may be disorienting for nonvisual users. Use a simple list structure whenever possible. As with headings, lists should be used correctly and for the right purposes. Lists should never be used for merely indenting or other layout purposes. When lists are formatted using asterisks, hyphens or images to create the look of bullets in a document, users of assistive technology are not able to detect the hierarchical structure and relationship of the list items. You should never rely on indentation to provide a visual list, use the proper structure instead. Lists should be created using the built-in tools for ordered (numbered) and unordered (bulleted) lists. Without using these tools, a list is not really a list, which makes the content more difficult for assistive technology users to fully understand. Select the text that you want to add bullets or numbering to. On the Home tab, under Paragraph, select the appropriate bullet from the list. In the Content Editor, select the text that you want to add bullets or numbering to. Select the appropriate bullet from the list. You will remove significant barriers for users of assistive technology if you take these suggestions into consideration when creating course content. An added bonus is that if you include properly structured lists when creating your course content you will be ahead of the game in the event you do have a student who requires the use of assistive technology. 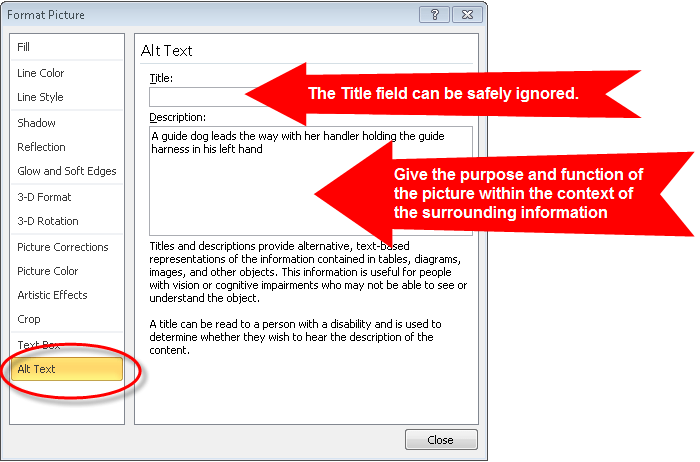 The fourth tip in my series of accessibility related blog posts will focus on alternative text (alt text). Computers can read text on a screen but images, graphs, and charts are meaningless to visually impaired users. 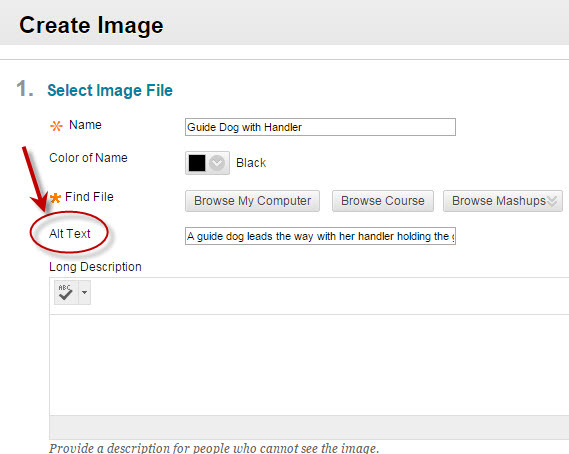 Alt text is an alternate method for supplying information about images to users who are visually impaired. Alt text is important for screen reader users because a screen reader cannot describe an image. Since screen reader software cannot interpret images, it relies on alt text to communicate image information to the user. When an image does not have alt text the only information the screen reader can relay is that there is an image on the page and provide the file name for the image. Alt text should describe an image so it makes sense in context. If a picture is worth a thousand words, then a short alt text description may be a poor substitute. While a concise alt text description is important, the alt text should be less than 125 characters. You want to think about what is the most important information you are trying to get across with the image and stay within the 124 or less characters. If the image requires a lengthy description, you should describe the image in the content of the page. There are several ways to handle complex images (e.g. charts, data, statistics, etc.) where a short description is not possible. The best solution is to include a thorough description of the complex image in the content of the page, immediately before or after the image. If you don't want to add more content to your page, another preferred alternative would be to create another web page with just a description of the complex image and link to it near the image. Additionally, text descriptions of graphs and charts can help all students understand difficult concepts. How alt text is written will vary depending on the type of image. Most screen reader software announces the presence of an image by appending a word such as "graphic" to the alt text, so using words such as "image" "graphic" and "photo" are unnecessary in the alt text, unless it helps to convey further meaning important for a user to know. There is no need to include "image of," "picture of," or "photo of" in the alt text in this example because the screen reader will announce the presence of the image. Additionally, images that contain text (as in a logo) should generally be coded to just include that text as the alt text. Many images are used only for visual interest, they aren't meant to convey any meaning or important information. In this case, it is best to use what is called NULL alt text or empty alt text. This is done by entering two quotes ("") with no spaces in between in the alt text box. So, how can you add alt text to images? Listed below are instructions on adding alt text in MS Word and PowerPoint documents as well as in Blackboard. 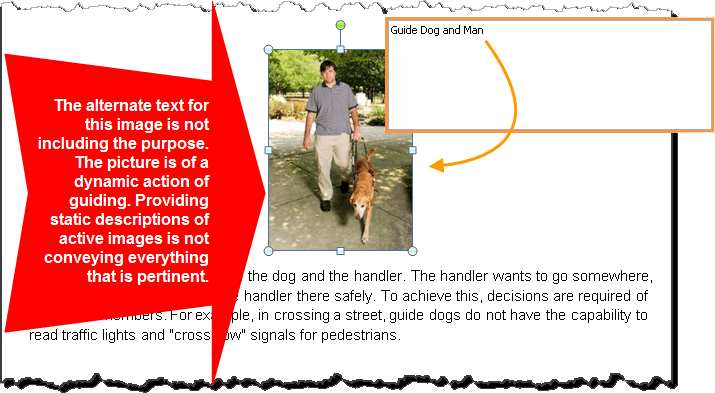 You will remove significant barriers for the visually impaired if you take these suggestions for adding alt text into consideration when creating course content. 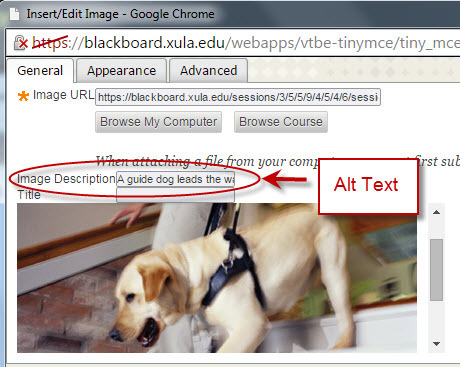 An added bonus is that if you take the extra step to include alt text when creating your course content you will be ahead of the game in the event you do have a visually impaired student.